Bun Maska is a young love story serial that premiered on the channel Zee Yuva which was launched in August 2016. The story is centered around on the relationship between a young voice over artist Maitreyee and Saumitra, a homeopathic doctor. Maitreyee is a character who lives in the past, her wardrobe filled with useless old memories. She stores everything – Right from her old roller skates to an aquarium. The twist in the tale happens when she visits a meditational center. She gets the feeling of quitting the materialistic world and to enter spiritual pursuits. Saumitra does not have a clue as to what is to be done as his girlfriend is going to break up on a weird reason. Maitreyee’s wise grandmother convinces her to find a GF for Saumitra before saying goodbye to him. The show has an interesting ensemble of characters both from Maitrayee’s and Saumitra’s families as well as their group of friends. The lead actors Shivani and Shivraj worked together as a part of the movie Phuntroo in 2015. 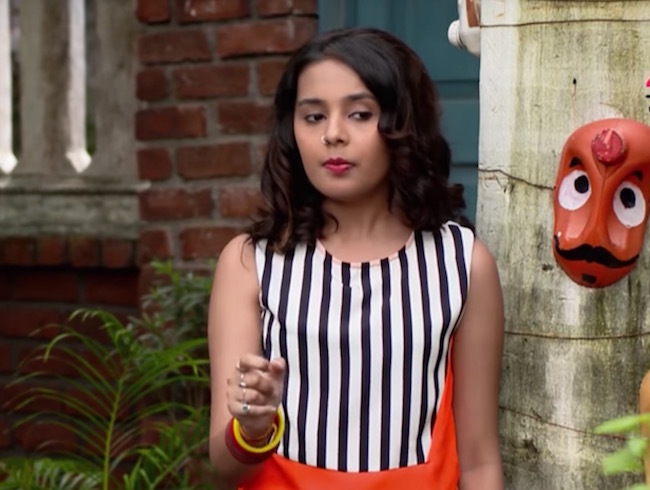 Actress Shivani Rangole plays the role of the eccentric Maitrayee, the female lead of the show. Actor Rohan Gujar, who played the role of Pintya in Honar Sun Me Hya Gharchi is seen on the small screen again. He is playing the role of Maitrayee’s friend. Serial is really nice. theme is good. I like acting of Vighnesh. His comedy is awesome. Even Shamsudars acting is entertaining. Character of maitreyi was interesting before which is being boredom now. Acting of Nalini, Akruti, chumbak looks overacting and boredom. What is her real name Aakruti…..
Are tya maitri la change kara overacting karti vedya….. Very nice story. I was impressed with the theme. Maitreyi n her parents, Saumitra, Vishesh have acted very good. But sometimes the acting by friends esp. Chumbak seems over. I think if there were more experienced n mature actors it would be more successful n interesting. Khup chan serial aahe kalakarache kam uttam aahe aani concept best aahe.